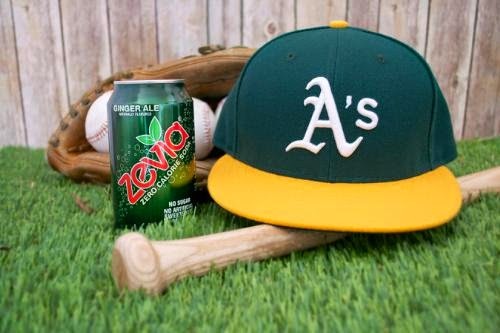 Starting with their 2014 Opening Homestand later this month, the Oakland Athletics will introduce Zevia as the first-ever naturally sweetened, zero calorie soda in Major League Baseball. The groundbreaking partnership will include Zevia zero-calorie, naturally sweetened sodas available at concessions throughout O.co Coliseum in branded coolers, sampling for fans, in-game advertising and promotions, along with special events on the 2014 calendar. Zevia will offer six of its familiar flavors in stadium throughout the season, including Ginger Ale, Cola, Ginger Root Beer, Cream Soda, Black Cherry and Grape. Zevia is sweetened with a blend of stevia, a plant-based, smarter alternative to artificial sweeteners, so it is both all natural and contains zero calories. Recently, monk fruit was also added as a key ingredient to sweeten its product offering. "From their success during the 1970s and 80s to the era of 'Moneyball,' the A's have always been an innovative franchise that succeeds using a different path than their competitors—this is every bit the Zevia story, as we've built the leading zero calorie, naturally sweetened soda brand, while our larger competitors stay in the bullpen," said Zevia CEO Paddy Spence. "American families have made clear they want alternatives to artificial sweeteners—the Oakland A's just gave them one." "We are pleased to be working with Zevia to provide our fans with a natural zero-calorie option," said A's President Mike Crowley. "The A's have always been open to a new way of doing things and we are thrilled that Zevia has come on board as a business partner." Zevia branding will be highly visible at the Coliseum, appearing on rotating billboards behind home plate and as sponsor of the team's popular Dot races, which appear on the stadium video boards during inning breaks. Zevia will also receive title sponsorship of Breast Cancer Awareness Day, including recognition on an A's co-branded pink rally towel, distributed to 10,000 fans at that game. In addition to the A's sponsorship, Zevia works with a number of high-profile partners who were brand fans before becoming partners. Shepard Fairey's commercial agency Studio Number One creates Zevia's colorful brand visuals, while family-friendly rapper Biz Markie serves as a spokesperson. About ZeviaZevia is the first soda brand focused exclusively on zero calorie soda naturally sweetened with a unique blend of stevia and monk fruit. Zevia provides an alternative for soda and diet soda drinkers who are looking for beverage options without sugar, calories and artificial sweeteners. With natural formulas that are certified vegan, Kosher and gluten-free, Zevia is sold at more than 16,000 grocery, natural and specialty food stores in the United States and Canada. Please visit www.ZEVIA.com to learn more about Zevia. Follow us on Twitter http://twitter.com/ZEVIA or "like" us on Facebook http://www.facebook.com/ZEVIA.